Personal Details: Fanny Isobel Catherine Tyson was born in 1890 at Balranald N.S.W. ; she was one of ten children born to John and Theresa Tyson. Her nickname was ‘Topsy’. Between 1902 and 1904 the family moved to Elsternwick, Victoria where her mother died in 1904. Topsy trained for 3 years as nurse at the Bendigo Public Hospital, and had the rank of Staff Sister for 8 months at the time of her enlistment. 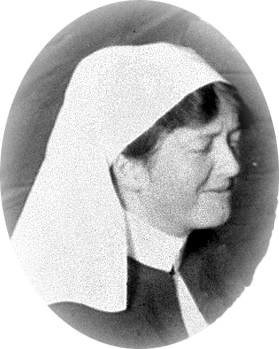 Her sister Theresa was also a nurse at the Bendigo Public Hospital, she also joined the AANS. Three of her brothers served with the AIF. Enlistment Details: Fanny enlisted in the Australian Army Nursing Service on June 17th 1915 and was assigned to the 1st Australian General Hospital. She was 25 years old. Details about her role in the War: Topsy Tyson embarked from Melbourne on the HMAT Wandilla on the 17 June 1915. I am assuming that as she ‘proceeded to join the BEF’ from Alexandria and disembarked at Marseilles on the 6th April 1916 she must have previously been in the Middle East. Both her casualty form and the 1st AGH diary only begin from April 1916. On the 13th of April she joined No.6 General Hospital in France until the 23rd April when she reported to No. 1 Australian General Hospital, where she remained until she went on leave to Rouen on 3rd February 1917. She rejoined from leave on the 22nd of February and was detached to the No. 10 Stationary Hospital in St. Omer where she remained until 17th July 1917 when she was posted to 2nd Australian Casualty Clearing Station at St. Omer. From there she was again posted to the 10th Stationary Hospital in Rouen. On the 4th January she was reposted to 2nd Australian General Hospital in the field, and then reported for temporary duty with the Deputy Director of Medical Services Boulogne at Wimereux. From there she went to Cannes on leave and ceased to be attached to the 2A.G.H and went to the 5th Stationary Hospital in Dieppe on the 1st February 1918 until she went on leave to the UK in October where she was to be retained on completion of her leave. On the 6th October 1918 she was attached to the 2nd Australian Auxiliary Hospital at Southall and detached to No.2 Group Clearing Hospital at Hurdcott. On the 20th of April 1919 she was admitted to the 1st Australian General Hospital at Sutton Veny where she died at 8pm from a Cerebral Haemorrhage. She was 28 years old. Topsy was buried with full Military honours. The coffin was draped with the Australia Flag and was conveyed to the graveside on a Gun-carriage preceded by a Firing Party from No.1 Australian Training Brigade, Sutton Veny. Six Australians supported the Pall. The ‘Last Post’ was sounded and volleys fired over the grave. A large number of Officers, NCO’s and Men followed the remains and were present at the graveside ceremony. Flowers were sent from her colleagues at her various postings. Her sister Theresa and her brother Charles Tyson and her friend Mr. Fry were also present at her funeral.